Wow, I am so excited about this company that we're featuring as part of the Spectacular Gift Shopping Guide! Dolls are a big hit with girls, and I have to say, this particular line is definitely amazing! I'm talking about Lottie Dolls; a new line that has dolls with real little-girl proportions, because after all-dolls are designed for little girls to play with! She doesn't need jewelry, makeup and high heels to be pretty or fun to play with, and I just love that about these dolls! 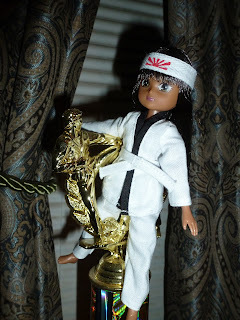 I received the Kuwaii Karate Lottie Doll and the Body Board Outfit Set for review. I have to admit though; the Karate outfit is such a hit with M that she hasn't even changed Lottie's clothes yet-which is a rarity for her! 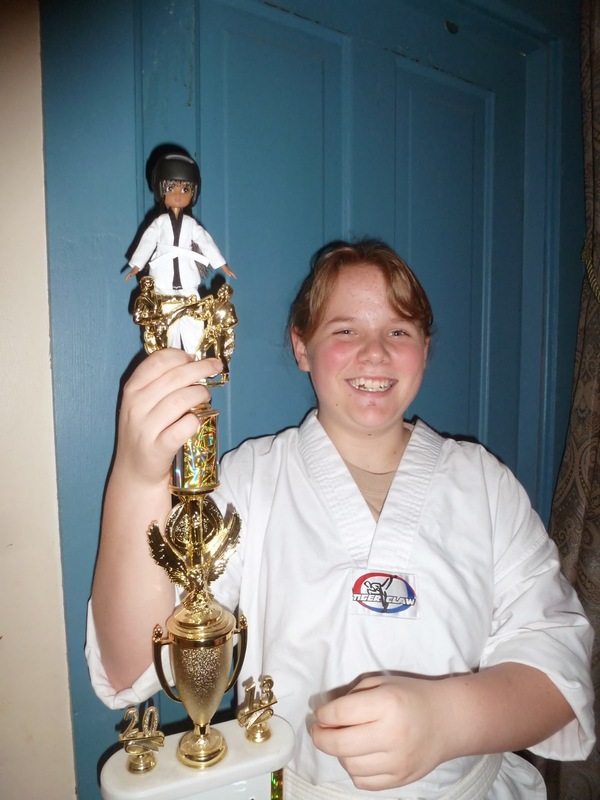 The reason for this is that M takes TaeKwonDo along with a couple siblings (she's going to be testing for her green belt in the next couple weeks, and I'm so proud of her!) 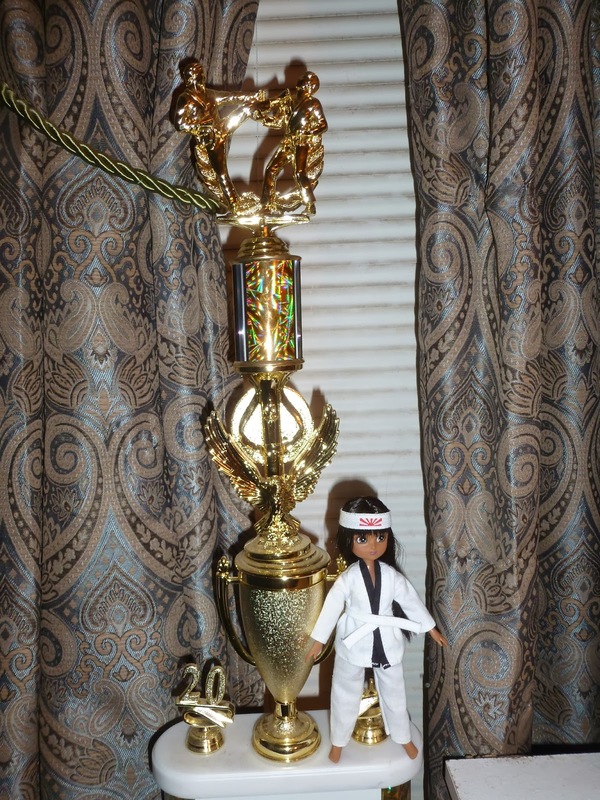 so the Kuwaii Karate Lottie is honestly perfect for her. 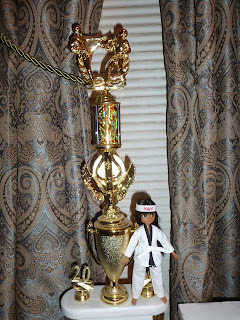 She was so excited to have a doll in the karate gi (except she has decided it's actually a TKD uniform). Lottie also comes with a yellow belt, headband, and sparring helmet, so girls can actually play karate tournament, or even give Lottie a belt test to promote her from white to yellow belt. M, posing with Lottie and her (M's) TKD Tournament trophy! Lottie can do a split! I really love the Lottie Dolls, and they are so much better for little girls to be playing with than the traditional grown-up dolls with fancy clothes and high heels. I firmly believe in letting little girls be just that-little girls-instead of feeling like they have to wear makeup and heels at 8 or 10 years old. 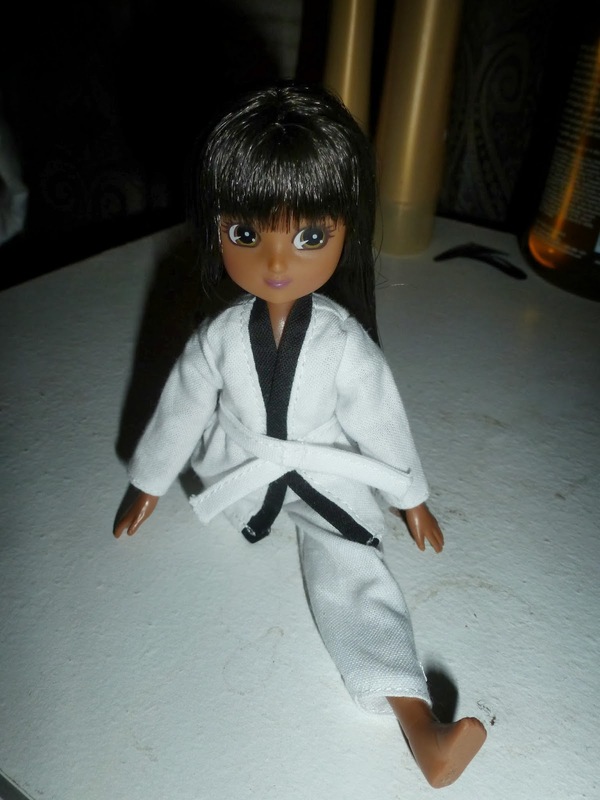 I also like that the Lottie Dolls encourage girls to be athletic, and have specific interests/themes. Other dolls include Lighthouse Keeper (a real cutie), Pony Flag Race, and Robot Girl. All the dolls are 7.5 inches tall, with bendable knees and movable/posable arms and legs. Honestly, I can't think of a better doll to give a little girl than a Lottie Doll! One of my readers will receive a Lottie Doll and Outfit Set!! (Choose from Butterfly Protector, Kawaii Karate, Pirate Queen, or Robot Girl Dolls, and Pirate Queen Accessory Set, Girls United Outfit Set, Body Board Outfit Set, Blue Velvet Outfit Set, Raspberry Ripple Outfit Set, Raising The Bar Outfit Set or Sweet Dreams Outfit Set). I would pick the pirate queen doll with the raspberry ripple outfit set. Pandora’s Box Lottie would be perfect for my granddaughter. These are such cute dolls and age appropriate! The Pandora's Box Lottie is adorable. I'd choose Robot Girl and the Raspberry Ripple outfit. I would like the Pirate QUeen doll!